Besakih Temple is the biggest Hindu Temple in Bali which is the local people call Pura Besakih. Its own beautiful view from the top of temple area where we can see the wide nature panorama until to the ocean so that way this temple is been visited by many tourist from all over the world. 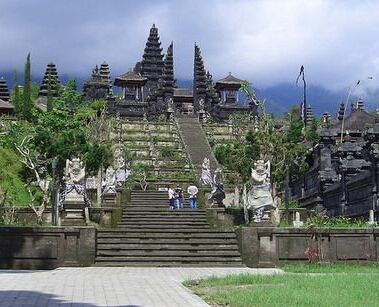 Besakih Temple is located southwest side bevel of Mount Agung, The highest mount in Bali. It is because pursuant to Mount Agung confidence is holiest and highest mount in Bali Island. The Besakih name is come from the word of Basuki the old language from Sanskrit Wasuki, and then it become the ancient Java Language. In this sanskrit, the Basuki means congratulation. In mythology of Samudramanthana has mentioned that Basuki is a dragon that twines the Mount Mandara. The omission has come from tradition megalithic which had been indicated that it has to be sanctified place. It seems the Besakih is coming from very old era which is far before the existence of Hinduism influence. Here in after, an Ancient Bali King Of Sri Kesari Warmadewa found the Merajan Selonding Temple in this temple complex area. He also commands to build the Blanjong Monument that is located in Sanur Village. The Besakih Temple complex is built pursuant to cosmos balance. It is based on the nature conception which is disseminating the fundamental temple complex that is arranged to pursuant of the way direction. So this building can deputize nature as symbolic of the world balance existence. As we familiarize, that the point direction way like East, South, West and Middle as center point and each direction is named by Mandal. In Hindu phiosopy, Panca Dewata is manifestation of Siva God. Like Penataran Agung Temple as center, we find in courtyard conception show the solidarity conception between the original Indonesia culture namely tradition megalithic in form of Punden Berundak-undak with the Hinduism concept. The ancient omission which is existing in Besakih Temple complex can be classified into 2 type, those are omission pertained by megalithic tradition and classic era. Besakih temple beside as the altar for the Hindu People in Bali, it is also as a tourist destination in Bali.